RUSH: Here we go with Barack Obama. As you know, he was up in New Hampshire — do you know, by the way, TV ads for Barack Obama are going to start airing this weekend? Presidential ads for Barack Obama in New Hampshire start airing this weekend. Hillary, I think, is starting to get panicked because she’s called up all of Bubba’s old buddies, Carville and Begala and Joe Lockhart, she had them over to dinner to discuss what to do about this. Her team wasn’t there. They’re all one team, of course, but publicly Carville and Begala have said, (paraphrasing) “Well, we’ll help, but we’re not officially on the team.” That allows them to have more movement and latitude under the radar. Anyway, Obama up in New Hampshire being treated like a god making a speech. Now, apparently before he made the speech, Maureen Dowd had written something about his big ears. Obama, after the speech, made a beeline for Maureen Dowd who was in the audience to tell her that he didn’t appreciate her writing about his big ears. Now, there’s a lot of noise here and it’s very muddy. I’ll translate it for you, but here’s how it sounded. 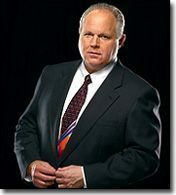 RUSH: “We’re just trying to toughen you up.” Here is what Barack Obama said.”You talked about my ears, and I just want to put you on notice: I’m very sensitive about — What at I told them was, ‘I was teased relentlessly when I was a kid about my big ears. '” Now, there are many aspects of this, folks, that we need to delve into and explore. For one thing, I mean you know me, if the guy’s sensitive about his big ears, we need to give him a new name, like Dumbo. But that doesn’t quite get it. How about Barack Obama Hussein Odumbo. Well, if he’s sensitive — stop to think about this. This is a man being lauded as the savior of the country, a presidential candidate ready to be anointed, and he can’t handle being teased about his big ears? He goes out to Maureen Dowd and says, I am putting you on notice? Is that a threat? I want to put you on notice? Can you imagine what the reaction would be if any Republican went up or any conservative went up to a member of the media and said, “I’m putting you on notice right now.” How bullied can the Drive-By Media be by this candidates? Of course, Hillary has her testicle lockbox, and it works. She gets kid-glove treatment, softball questions wherever she goes. We’ve already attributed this to the testicle lockbox that she has. But here’s the next thing, and this is something that everybody seems to be deaf about. He seems fragile. This guy actually seems fragile. He is expecting not to be teased about — what are the editorial cartoonists going to do with this now? (interruption) Oh some of them will, Mr. Snerdley, some of them will. You know, you were wrong yesterday, and you’re going to be wrong today. I bet you yesterday that this Tehran “Holocaust didn’t happen” convention would blossom and leave Iran — and it has — people seriously debating this now in little oddball corners of the world. I’ve already seen editorial cartoons, maybe on conservative websites that are parodying — that’s what editorial cartoonists do, they exaggerate the slightest physical characteristic. But, at any rate, how fragile can he be? He has been given uncritical — not only uncritical, but fawning positive press coverage for a couple of years now, then one liberal columnist quips about his ears, his ears, and he’s fretting about it, and he can’t wait to go put her on notice and tell her he doesn’t like it because he’s been made fun of about it ever since he was a kid. If he’s so sensitive about his ears, imagine how his tent will fold when he gets deep into a campaign. Wait ’til Hillary pulls out the testicle lockbox for him in the middle of a campaign, wait ’til Hillary Clinton really gets down and dirty and the guns start blazing, what’s this guy going to do? We may have discovered an Achilles’ heel. He’s not tough enough for this. I mean, really, I’m not overestimating this, nor am I exaggerating this. I mean, to go out there and say, “I was teased relentlessly when I was a kid about my big ears, I’m very sensitive about it.” “We’re just trying to toughen you up.” That alone means that they know he needs toughening up and that they’re going to try to help him along with it. There’s a lot to learn in this one little episode. And nobody but us, nobody but me is playing this audio for the very reasons that you and I have discussed. Plus it’s tough to hear because it’s so muddled. During the break Snerdley continued to argue with me that editorial cartoonists nor anybody else will make fun of Obama over his long-held sensitivity since childhood over his Dumbo-type ears, his elephant ears. Snerdley says, “You don’t understand how this is going to play out. His whole method here is to portray himself as just an average guy, and when he goes out there and actually admits that he’s sensitive and he was made fun of as a child, well, everybody can relate to that.” Yes, but that’s not how you deal with crisis. You don’t deal with adversity by basically, (crying) “You hurt my feelings! Stop it.” You know, you can be Oprah Winfrey and you can be a star on the Oprah show, but you cannot be elected president with that kind of behavior. Barack Hussein Odumbo, by the way, did not go public with this ear sensitivity thing. He sought MoDo out in the audience, and nobody aired that. Well, I guess it was on C-SPAN, but nobody’s picked it up from C-SPAN except, of course, I. He didn’t know the microphone was still on when this happened. He thought he was in a private moment with her. So he hasn’t gone out there and tried to build this bridge, this bond of relatability with average schlubs. Do you think that’s going to play well at union headquarters? I mean, how many of those guys out there are worrying about things they were made fun of? They just smash people that made fun of them. They just get rid of them. Jimmy Hoffa, concrete, Giants Stadium, six feet under. (interruption) Every woman with a child what? Will relate to it? Oh, well, fine, then we stop women from voting in ’06 or ’08. Don’t be silly in there.